The oil and gas industry is touting the potential of fracking in California to tap the largest tight oil formation in the continental United States, which they say contains up to 64 percent of the nation's deep-rock oil deposits. Fracking in California is primarily used to extract oil. In some cases fracking is taking place on private land without the owner's knowledge. The Western States Petroleum Association (WSPA), whose members account for 80 percent of the oil and natural gas drilled in California, said WSPA companies fracked 628 oil wells in 2011 -- about a quarter of all oil and gas wells drilled across the state that year. In 2013 California's Department of Conservation director Mark Nechodom estimated the state "might see around 650 hydraulic fracturing jobs a year." More common than fracking in California is acid jobs, an old well completion method that involves pumping chemicals such as hydrofluoric acid into wells to melt rocks and other impediments to oil flow. Companies are not required to report when they do it. A report released in January 2015 stated that nearly half of all new oil wells in the state of California employed the use of fracking. Before 2014, the Division of Oil and Gas of the California Department of Conservation did not monitor, track or regulate hydraulic fracturing, stating in a Feb. 16, 2012 update to its website that “fracking is used for a brief period to stimulate production of oil and gas wells” in California, but “the Division doesn’t believe the practice is nearly as widespread as it is in the eastern U.S. for shale gas production,” negating the need for monitoring. What the Division does not say, according to the Environmental Working Group, is that most fracking in California is used for oil, not gas, production. The passing of State Senator Fran Pavely's SB 4 put in place some process to track hydraulic fracturing and another enhanced well completion form called acidizing. Center for Biological Diversity researchers note that ten California counties: Colusa, Glenn, Kern, Los Angeles, Monterey, Sacramento, Santa Barbara, Sutter, Kings and Ventura. The exact number of fracked wells in the state is unknown, but the Environmental Working Group states that it "is clear that the total likely reaches into the thousands. Industry documents show that by the mid-1990s, more than 600 wells had been fracked in one Kern County oil field alone. Representatives of Halliburton told EWG in the fall of 2011 that 50-to-60 percent of new wells being drilled in Kern County were hydraulically fractured." In June 2013 the Los Angeles Times reported that a USC/LA Times poll showed that more than 70% of California voters favored banning or heavily regulating chemical injections into the ground to tap oil and natural gas. It was reported in September 2013 that Californians (51 percent) continue to oppose than favor (32 percent) increased use of fracking, according to a statewide survey released Wednesday evening by the non-partisan Public Policy Institute of California. Hydraulic fracturing - creating fractures from a wellbore drilled into reservoir rock formations - has been used on thousands of wells in California for over fifty years, according to a review of scientific articles by the Environmental Working Group. The current fracking technique of high-pressure water, chemicals, and sand is often seen as originating in the late 1990s, in the Barnett Shale in Texas. In 2012, regulators told the Los Angeles Times that they monitor drilling operations "quite thoroughly" under existing law, but also said there is a "need for more disclosure of what chemicals are used in oil production." According to the Times: "State Sen. Fran Pavley (D-Agoura Hills), chairwoman of the Committee on Natural Resources and Water, wrote to state regulators [in 2011] asking basic questions: 'Where does fracking take place; How often is it used; And what are the potential risks?' Regulators had few answers, saying they had 'limited data' because the state has no reporting requirements." Many state regulators assert that fracking in California is "radically different" from drilling in other parts of the U.S., saying the process has long been performed in the state for shorter duration with much less water to loosen crude in depleted oil wells. Montery Shale Formation in California. California is estimated to have more tight oil (shale oil) than shale gas. Most estimates focus on the Monterey Shale, a rib-shaped formation that extends from northern California down to the Los Angeles area, offshore, and onto the outlying islands, spanning 1,750 square miles. Counties include Kern County, Orange County, Ventura County, Monterey County and Santa Barbara County, California. It is composed of many substances and is not flat like other shales due to frequent earthquakes. Some companies have called the Monterey Shale "arguably the largest shale play in the US." Estimates vary about how much oil lies in the state's shale rock formations. The estimate of "technically recoverable oil" is determined by multiplying the total amount of "oil-in-place" by the “recovery factor,” or the percentage of oil that can be recovered with today’s technology. Venoco, one of the companies with a significant presence in Monterey, once said there might be 300 billion barrels of oil in the Monterey Shale, but their first well was labeled "uneconomical," and their estimate has been seen as far too high. In 2011, the U.S. Energy Information Administration said there could be up to 15 billion barrels of crude in the Monterey Shale, an estimate repeated by the Department of Energy and NY Times. In May 2014 the EIA said 600 million barrels of oil can be extracted from the Monterey Shale with existing technology, cutting by 97% its earlier estimate of 13.7 billion barrels. The Energy Information Administration estimated that Monterey would produce 550 million barrels total per well, but “operators today are reporting typical flowrates averaging only around 350 to 400″ barrels per day, according to a November 2012 article in World Oil (fee required). According to Dave Roberts at Grist: "At 400 barrels a day, it would take a well 3,767 years to hit 550 million barrels." Geologist J. David Hughes of the Post Carbon Institute argued that "initial productivity per well from existing Monterey wells is on average half to a quarter" of EIA assumptions, and cumulative recovery of oil per well "is likely to average a third or less of that assumed by the EIA." This estimate comes from his 2013 analysis of existing data: "1,363 wells have been drilled in shale reservoirs of the Monterey Formation. Oil production from these wells peaked in 2002, and as of February 2013 only 557 wells were still in production. Most of these wells appear to be recovering migrated oil, not 'tight oil' from or near source rock as is the case in the Bakken and Eagle Ford plays." He concludes that the EIA's 15 million barrel estimate is likely highly inflated. The database maintained by the oil and gas industry’s website Frac Focus, where companies can voluntarily disclose information about their fracking practices, lists 78 wells in California as of Feb. 21, 2012. According to the Environmental Working Group: "Of these, one is in Los Angeles, one in Ventura County and two are off the coast of Long Beach. One is shown near Santa Barbara on a map, but the attached documentation places the well in Kern County. The other 73 wells are also in Kern County. All of these wells were fracked sometime in 2011 or 2012. Listings on Frac Focus are entirely voluntary and are known to be incomplete, so this accounting is not likely to be comprehensive." In 2011, a Congressional investigation determined that 26,444 gallons of diesel fuel had been injected into California wells in hydraulic fracturing fluids from 2005-2009. In 2011 notices to drill new natural gas wells in Northern California were received at a rate not seen in over twenty years. As of August 2011, the California Department of Conservation issued 178 permits to drill new wells in Butte, Colusa, Contra Costa, Glenn, Solano, Sutter, Yolo, San Joaquin, Sacramento and Tehama counties. At that rate, 267 notices would be filed by the end of 2012, compared to 137 in 2000 and 78 in 1995. In October 2015, DOGGR released to the public an audit of its regulation program. The audit concluded that since 2007, most oil projects in the Los Angeles area had not been subject to a required annual review. In 2012 it was reported that PXP was using fracking in the Inglewood oil field, the nation's largest urban oil field, which has been operating in Los Angeles since the 1920s and extends up through parts of the central coast and San Joaquin Valley. A 2006 release of noxious gases at the Inglewood Field galvanized community members and environmental groups to sue Los Angeles County, forcing it to augment protections the county had previously created in partnership with PXP. The parties reached a settlement in 2011 that further limited PXP's oil drilling activities, including reducing the number of wells the company could drill. As part of the settlement agreement, PXP agreed to conduct a study that examined the feasibility and impact of current and future fracking at the oil field. It would be the first study to look at the impact of fracking in California, including its impact on groundwater. According to the Natural Resources Defense Council, the community that surrounds the oil field did not know about the 2012 test fracking until March 9, after the fracking was complete. According to FracFocus, the two vertical wells were fracked in September 2011 and January 2012. PXP used up to 168,000 gallons of water laced with chemicals in one well to a depth of about one and half miles. The Regional Water Quality Control Board, Los Angeles Region, is concerned the impact such practices may have on the above water supplies. Over one million people live within five miles of the site. The fracking site also sits atop a fault line capable of 7.4 magnitude earthquake. On October 10, 2012, the environmental consulting firm Cardno ENTRIX released a report commissioned by PXP, entitled “Hydraulic Fracturing Study: PXP Inglewood Oil Field,” which concluded that fracking could be done safely in the area and seismicity could be mitigated. Cardno Entrix had previously been hired by TransCanada to do the environmental impact statement (EIS) for the Keystone XL Pipeline. PXP and Los Angeles County contracted with JPMartin Energy Strategy LLC to peer review the report. J.P. Martin is director of the Shale Resources and Society Institute, which was created after a gas industry-funded lecture series on shale gas at SUNY Buffalo. SSRI produced a study in May 2012 finding no averse effects with fracking; all four co-authors were later found to have ties to the oil and gas industry, prompting 83 SUNY Buffalo faculty and staff members to call for an independent investigation into the origins of the SRSI. Fracking takes place off the coast of Long Beach, California on man-made oil islands. It was reported in 2013 that 203 fracking operations had taken place offshore Long Beach at six different sites over the past 20 years. An April 2015 investigative piece in OC Weekly noted that since 2012 there have been at least 22 hydraulic fracking operations completed offshore in Long Beach as well as at least 150 acidizing operations and 90 gravel packing jobs. In late June 2015 Thums Long Beach Co applied for nine fracking permits for offshore operations in Long Beach. The permits, which is the first step to get the operations approved, were okayed by the California Division of Oil, Gas and Geothermal. As of May 2012 there are 95 drilling wells posted on FracFocus, with the vast majority of the fracking projects reported in Kern County. FracFocus pinpoints a cluster of 58 wells fracked in 2011 between Lost Hills and McKittrick by XTO Energy/ExxonMobil. Many of the frack jobs pumped several hundred thousand gallons of water into wells about 3,000 feet deep. Another cluster of 12 wells in the Wasco-Shafter area was fracked in 2011 by Occidental Petroleum. In May 2012, Kern County's biggest oil producers, consenting to a request by state regulators, agreed to share information about their fracking operations by the end of June 2012. Chevron, Berry Petroleum Co., Bakersfield's Aera Energy LLC and other members of the Western States Petroleum Association will disclose data on their work with fracking on fracfocus.org. NASA found the second brightest methane hot spot in the U.S. from space appears to be above Harris Ranch, California’s largest beef producer, and near the Bakersfield oil fields. In November 2015 the Kern County Board of Supervisors unanimously voted to approve one single environmental to take in effect December 2015 that would fast track individual projects in as little as seven days. Three oil industry groups spent more than $10 million in crafting the proposal. As of 2012 Venoco holds about 256,000 gross acres in the Monterey Shale formation, which starts in Monterey County and stretches across central California. An additional 60,000 acres have already been drilled. The firm has drilled more than 20 wells across the formation since 2010, and invested $100 million -- or nearly 40 percent -- of its 2012 expenditure budget to exploring for oil. The company has drilled four exploratory wells in Monterey County and plans for nine more. A move to ban fracking in Monterey County is slated for the November 2016 election. Based on information gathered from a 2010 oil prospectus from Venoco, investigated by the Environmental Defense Center (EDC), and confirmed by the federal government, there was fracking done in 2009 on the Gail oil platform in the Sockeye field in federally controlled waters near Santa Cruz Island in the Channel Islands. In another financial disclosure document there are hints from Venoco's public filings that the company planned to enhance, through prop fracture (an older method of enhancing older wells) or possibly fracking, their other active offshore oilfield in California state waters, known as the South Ellwood -- a field approximately seven miles long and part of the northern flank of the Santa Barbara channel and extending to the Ventura basin. In July 2013 the news site Truthout reported that federal regulators approved at least two hydraulic fracturing operations on oil rigs in the Santa Barbara Channel off the coast of California since 2009 without an updated environmental review to account for modern fracking technology. Regulators approved both operations by signing off on modifications to existing drilling permits. In an internal email, the Bureau of Safety and Environmental Enforcement (BSEE) Chief of Staff Thomas Lillie wondered how the agency could allow fracking offshore without producing an environmental impact statement (EIS) on the effects. No studies have been performed on the effects of fracking fluids on the marine environment. According to a BSEE fact sheet, fracking has occurred 11 times in the Pacific drilling region during the past 25 years, although BSEE officials say the number is only an estimate. Under heavy pressure from environmental groups and state politicians, the California Coastal Commission launched an investigation into offshore fracking, saying it was not aware that fracking technology was being used offshore. On August 6, nine California lawmakers sent letters to the Interior Department and the EPA demanding a federal investigation into offshore fracking, and asking the coastal commission to review federal offshore fracking permits and use its authority to block fracking activities that could harm the California coast. An October 2013 Environmental Defense Center review and analysis of federal records received through the Freedom of Information Act (FOIA) showed that at least 15 fracs have occurred offshore California, with several more proposals pending. But according to EDC: "More fracs have almost certainly been conducted, however, as federal regulators were until recently unaware that the practice was being used." Saying the offshore frac jobs raise questions about compliance with environmental laws, EDC recommends a "moratorium on offshore fracking and other forms of well stimulation unless and until such technologies are proven safe through a public and transparent comprehensive scientific review" and to "prohibit the use of categorical exclusions (exemptions from environmental review) to authorize offshore fracking and other forms of well stimulation." According to interviews and drilling records obtained by the Associated Press in October 2013, energy companies employed offshore fracking at least 203 times at six locations over the past two decades. The drilling sites included waters off Long Beach, Seal Beach, and Huntington Beach, all popular tourist areas. A settlement to a lawsuit filed by the Center for Biological Diversity against the U.S. Department of the Interior prompted an offshore fracking moratorium off the California coast. A press release by the Center for Biological Diversity stated that the "agreement requires the Interior Department’s Bureau of Ocean Energy Management and Bureau of Safety and Environmental Enforcement to analyze the environmental dangers of offshore fracking and acidization under the National Environmental Policy Act. The settlement also prohibits federal officials from authorizing these inherently dangerous practices in federal waters until that analysis is concluded." In response to a moderate sized oil spill off the coast of Santa Barbara in May 2015, environmental groups warned that such spills are likely to happen again as long as offshore oil drilling, including fracking, continues to take place off the coast of California. On May 19, 2015 a rupture in a pipeline owned by All American Pipeline caused over 142,800 gallons to spill on the beach and ocean. It is commonly known as the Refugio Oil Spill named after Refugio Beach located just north of Santa Barbara where the majority of the crude landed. State wildlife workers would eventually collect and tall both dead and live birds and animals from the spill. The tally would include 202 dead birds, 65 live ones, 99 dead mammals, including 15 dolphins, ​and 63 live mammals. Sixty nine pelicans, sea lions, loons, and others would be treated and later freed. Sea mammals were found washed up in the cities of Ventura and Oxnard south of the spill. Federal regulators from the Pipeline and Hazardous Materials Safety Administration determined in February 2016 that external corrosion was the cause of the spill. The Santa Barbara Independent reported that federal regulators determined that All American Pipeline employees waited 89 minutes to report the spill. More than onshore and offshore oil employees facilities lost their jobs because oil was no longer transported through the area. ExxonMobil’s Heritage, Harmony, and Hondo platforms were out of commission after the Refugio Oil Spill shut down the All American Pipeline. Venoco was one of several local operating companies negatively effected by the pipeline spill. On February 16, 2016 Venoco missed submitting its $13.7 million semi-annual interest payment. Venoco, ExxonMobil, Freeport-McMoRan offshore oil platforms ceased operating shortly after the spill because the federal Pipeline and Hazardous Materials Safety Administration shut down pipelines moving crude oil to refineries. In November 2015, Venoco reported a net loss of $203.3 million for the third quarter. In October 2013 Los Angeles County leaders voted unanimously to oppose a plan to drill for oil in publicly owned parkland in the Whittier hills, saying the proposal would undermine open space protection throughout the county. The drilling was proposed by Matrix Oil Co. in agreement with the city of Whittier, neither of which said they will recognize the county's vote. Litigation is underway. The dispute is over whether the city has the right to allow oil drilling on 1,280 acres it purchased in 1994 with about $17 million of Proposition A funds, which were intended for conservation purposes. Under terms of the proposed lease, Matrix would use slant-drilling technology to tap an estimated 20 million barrels of tight oil, in exchange for the city receiving royalties. Whittier officials believe that they are legally entitled to the oil because they say the city retained the mineral rights, even if the land was purchased with county bond money for conservation purposes. In October 2014 the Wall Street Journal reported that California rail depots that will begin to handle oil from North Dakota’s Bakken Shale. In order to handle the demand, Alon USA Energy Inc. is building the state’s largest oil-train terminal Kern Country. 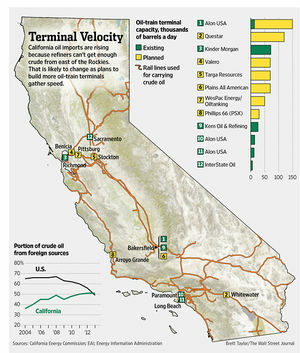 That terminal, which is to be completed in 2015, will receive 150,000 barrels of oil a day in Bakersfield, California. Additionally, Plains All American Pipeline is opening a 70,000-barrel-a-day oil-train terminal, also located in Bakersfield. The oil for this terminal will also come from fracked gas from North Dakota's Bakken Shale. The Phillips 66 Santa Maria Refinery in Arroye Grande, California plans to expand its rail line. The first Environmental Impact Review indicated the oil on the rail would be the North Dakota Bakken formation Shale. The October 2014 Environmental Impact Report indicated the rail would only haul Canadian tar sands from Alberta's boreal forests. According to Clean Water Action (CWA), fracking poses many risks for California's water supply since a single frack well can use upwards of hundreds of thousands to millions of gallons of water. Additionally, CWA second's EWG's report that fracking could pollute groundwater supplies in the state. A 2015 report by EWG, which analyzed data released by the state during the first year of new reporting requirements, found high levels of benzene in fracking wastewater. Additionally, the study revealed "the presence of hundreds of chemicals, including many linked to cancer, nervous system damage and reproductive disorders." In 2009, a jury in Kern County found that 96 million barrels of wastewater from drilling had leached from holding ponds onto a farmer's property, resulting in contamination of the aquifer beneath his land. According to the Environmental Working Group: "It’s unknown if any of this wastewater came from hydraulic fracturing; what is clear is that California’s ground and drinking water are not being adequately protected from the hazards of fracking and oil and gas operations in general." In 2010, contaminants from a wastewater injection well bubbled up in a west Los Angeles dog park. In July 2014 California state regulators shut down 11 fracking wastewater injection wells over concerns that the wastewater might have contaminated aquifers used for drinking water and farm irrigation. Following the shutdown, the EPA ordered a report within 60 days. In October 2014, the California State Water Resources Board has sent a letter to the EPA which confirmed that "at least nine of those sites were in fact dumping wastewater contaminated with fracking fluids and other pollutants into aquifers protected by state law and the federal Safe Drinking Water Act." Data released in February 2015 from a report on California fracking found that there was 700 times the federal standard amount of Benzene in fracking waste fluids. The raw data showed that 98% of wastewater samples taken from 329 fracking sites in the state had dangerous levels of benzene, which is a known carcinogen. The data was gathered over a one year period by the Center for Biological Diversity. In February 2015, Kern County water officials discovered hundreds of unlined fracking wastewater pits that were operating without permits. The Central Valley Regional Water Quality Control Board found that more than one-third of the region’s active disposal pits were operating without proper permits. The unlined pits raise concerns that groundwater could be contaminated in the area. The operators of these sites will not be shut down, but will have to apply for permits and monitor the sites if they are near water sources. In August 2015 California State Assemblyman Mike Gatto, who represents the Los Angeles. area, introduced a bill that will be considered as part of the California Legislature’s Special Session on health. The bill, if it passes, would require labels to be placed on food that was grown using fracking wastewater. Over 25,000 oilfield injection wells are operating in the state. Injection wells are used to increase oil recovery and to dispose of the salt and fresh water produced with oil and natural gas. Class II wells involve injecting fluids associated with oil and natural gas production operations - generally the brine that is produced when oil and gas are extracted from the earth. On July 7, 2014 California's Division of Oil and Gas and Geothermal Resources "issued cease and desist orders to seven energy companies warning that they may be injecting their waste into aquifers that could be a source of drinking water, and stating that their waste disposal 'poses danger to life, health, property, and natural resources.'" In all 11 companies were ordered to stop injections, while 100 more were being reviewed in California's Central Valley, which has been impacted by a severe three-year drought. State officials were concerned that toxic waste from injection wells could enter groundwater supplies that farmers are using to irrigate crops in the region. In March 2015 California regulators ordered a halt to wastewater injection operations at 12 underground well sites in Kern County. The action was part of a systematic statewide review of injection related to the oil and gas industry. In October 2015, the state shut down 33 wells that were injecting wastewater into California aquifers. As of October 2015 the state shut down a total of 56 wells in the state that were pumping wastewater into local aquifers. In 2016 Stanford University scientist, Rob Jackson, identified hundreds of hydraulic fracturing wells drilled into California aquifers located less than 2,000 feet below the surface. According to USGS Earthquake Science Center’s Art McGarr, there are no high-volume waste-water injection wells in California located within areas of high population density, to his knowledge. There is also, however, no way to verify this due to the lack of state and federal disclosure laws. Wastewater injection into disposal wells has been linked to a series of small earthquakes in Ohio and the U.S. mid-continent. Geologists in a February 2016 article in Geophysics Research Letters tied a September 2005 swarm of earthquakes near the White Wolf fault in Kern County to three wastewater disposal wells nearby. Using hydrogeological modeling, the authors found that wastewater disposal likely contributed to seismicity via localized pressure increase along the active fault. A 2012 ProPublica investigation into the threat to water supplies from underground injection of waste found the EPA has granted energy and mining companies exemptions to release toxic material in more than 1,500 places in aquifers across the country. The EPA may issue exemptions if aquifers are too remote, too dirty, or too deep to supply affordable drinking water; however, EPA documents showed the agency has issued permits for portions of reservoirs that are in use, assuming contaminants will stay within the finite area exempted. More than 100 exemptions for natural aquifers have been granted in California, some to dispose of drilling and fracking waste in the state's driest parts. Though most date back to the 1980s, the most recent exemption was approved in 2009 in Kern County, an agricultural area. Acidizing, also referred to as “matrix acidization,” typically involves the injection of high volumes of hydrofluoric acid, a powerful solvent (abbreviated as “HF”) into the oil well to dissolve rock deep underground and allow oil to flow up through the well. Conventional fracking, in which water and other chemicals are pumped at high pressure to create fissures in the rocks, reportedly does not work well in many parts of the Monterey Shale – a rock formation known for its complexity and low permeability, which makes fracking less effective. Acidizing, in contrast, is popular in California because the oil-bearing shale is already naturally fractured and buckled from tectonic activity. Hydrofluoric acid corrodes glass, steel, and rock. Drillers have been injecting it underground for years in diluted quantities (up to 9% HF) to get out the last bits of oil from nearly depleted wells, and injecting in stronger concentrations to dissolve oil-bearing shale. The concentrations of HF acid used by oil companies are unknown, as is what happens over the long term to the rock, and to the HF acid-laced water. Drillers must get a permit from the state Division of Oil, Gas, and Geothermal Regulations, but do not have to tell the state if they are fracking, using acid, or something else, although SB4, passed in September 2013, does include fracking and acidizing under state purview. HF is one of the most hazardous industrial chemicals in use, according to the U.S. Centers for Disease Control. The United Steelworkers want its use phased out of oil refineries entirely, calling it a risk too great for the steelworkers and the 26 million Americans living near refineries. The California Occupational Safety and Hazard Administration is not tracking HF acid usage underground within the state. Currently, large amounts of HF (precise volumes are an industry secret) are routinely trucked around California and mixed at oilfields, creating the potential for spills and leaks. Steam injection is an increasingly common method of extracting heavy crude oil. It is considered an enhanced oil recovery (EOR) method and is the main type of thermal stimulation of oil reservoirs. There are several different forms of the technology, with the two main ones being Cyclic Steam Stimulation and Steam Flooding. Steam injection is widely used in the San Joaquin Valley, Santa Maria, Oxnard, and other parts of California. Some have compared the process of Cyclic Steam Stimulation (CSS) to a chemical-free version of fracking. Unlike the more common well stimulation practice called steam flooding, cyclic steaming injects steam at high pressure specifically to break up relatively shallow, diatomaceous soil. CSS is used with ultra heavy oil and and oil sands, also known as tar sands. In CSS drillers install two wells, one of which goes for the heavy oil or tar sands. A second well nearby uses natural gas to fire up generators to heat the ground to up to 550 degrees Fahrenheit. The steam melts the oil or tar sands allowing it to move to the surface. A similar technique is called steam-assisted gravity drainage (or SAG-D), which is common in the tar sands fields of Alberta. SAG-D is a hyped-up version of huff-and-puff that uses multiple steam sessions and hotter temperatures to recover the naturally solid tar sands. SAG-D is commonly used in the Oxnard tar sands field. California state regulators began scrutinizing the practice in the aftermath of a Chevron manager's sinkhole death at the Midway-Sunset oil field in 2011. The theory behind the sinkhole is that high-pressure steam "migrated" from a nearby injection project and escaped through Chevron's problem well. According to the Bakersfield Californian, CSS created ongoing problems at the oil fields: "Other oil fields in Kern County have repeatedly experienced seepage and even violent volcanoes in which oil, water, and rocks can shoot 50 to 60 yards through the air. In fact, about a month and a half after [Chevron manager] Taylor's death, one such eruption at the sinkhole site continued for three days. That event prompted DOGGR to shut down steam injection activity within 500 feet of Chevron's 'broken' well." On October 16, 2012, environmental groups sued the state of California, accusing state regulators at the California Department of Conservation, Division of Oil, Gas, and Geothermal Resources with failing to evaluate the risks of fracking, even as fracking was used for 600 wells in 2011. Earthjustice filed the lawsuit in Alameda County Superior Court on behalf of the Center for Biological Diversity, Earthworks, the Environmental Working Group, and the Sierra Club. In July 2016, the Center for Biological Diversity sued the state of California for "finalizing an inadequate environmental review of fracking eight days before the release of a state-mandated study showing that fracking and oil industry pollution threatens air, water and public health." In late December 2011, environmental groups including the Center for Biological Diversity and the Sierra Club filed a lawsuit against the Bureau of Land Management claiming the bureau leased more than 2,500 acres of public land in Monterey and Fresno counties to oil companies without doing a thorough analysis of the potential environmental impacts of fracking. The lessees have 10 years to develop the land, after which it reverts back to the federal government if not drilled. On April 8, 2013 a federal judge ruled that the Obama Administration violated the National Environmental Policy Act when it issued oil leases in Monterey County, Calif., without considering the environmental impacts. As reported by Bloomberg: "U.S. Magistrate Judge Paul Grewal in San Jose, California, said the BLM violated the National Environmental Policy Act by relying on outdated reviews, conducted before the extraction process known as fracking spurred massive development of energy deposits, when the U.S. sold four leases in 2011 for 2,700 acres of federal land in Monterey and Fresno counties." In June 2011, Los Alamos rancher and vineyard owner Steve Lyons contacted Santa Barbara county officials after discovering that Venoco had fracked a well on his property. After a series of public hearings and forums, the Santa Barbara County Board of Supervisors decided unanimously in December 2011 that companies planning to frack would have to apply for a special permit from the county planning commission. Voters in Santa Barbara voted against a ballot measure in November 2014 that would have banned the practice of fracking in the county. The "no" vote constituted 63% of the total vote tally. In December 2014 the Environmental Defense Center filed a lawsuit against the U.S. Department of the Interior. The suit claims that Environmental Defense Center and two of its subsidiary agencies "approved 51 permits to drill from oil and gas platforms in the Santa Barbara Channel without properly conducting environmental studies or permitting public comment." In November 2014 voters in Santa Benito County banned the practice of fracking through a ballot initiative. San Benito voters passed the ban with 57% support. Oil companies spent $7.7 million to defeat fracking ban ballot measures in California in 2014, outspending opponents by nearly $7 million. The companies include Chevron Corp. and Occidental Petroleum. The spending was more than Neel Kashkari, a Republican running to be California’s governor spent on his campaign in 2014. In February 2015 Citadel Exploration, based in Newport Beach, California, sued to block San Benito County's voter-approved fracking ban in San Benito County Superior Court. Citadel claimed that local governments don't have the authority to impose bans. In November 2014 67% of voters in Mendocino County voted to ban the practice of fracking in the county. After a Monterey county administrator approved a Venoco permit for nine exploratory wells using hydraulic fracturing, a local land trust appealed. The issue was set to be heard at an Oct. 26, 2011 planning commission meeting, but Venoco pulled its permit application after the commission released a meeting agenda noting that it recommended supporting the appeal and denying the project. On May 15, 2012, Food & Water Watch joined with Gasland's Josh Fox, Environment California, Citizens Coalition for a Safe Community, Grassroots Coalition, and residents of surrounding neighborhoods to call for a ban on fracking in California, presenting the signatures of 50,000 Californians who have signed petitions supporting a ban. The protest was held at the Inglewood Oil Field in Baldwin Hills, the largest urban oilfield in the nation that also sits atop a fault line capable of 7.4 magnitude earthquake. On June 12, 2012 Food & Water Watch held a protest outside Culver City City Hall, demanding that fracking in Culver City and beyond be banned. In addition, a group called “Moms Against Fracking + Dads Too” was also meeting to participate in the protest event. On February 20, 2013 a group of California residents yesterday denounced the state's proposed rules on hydraulic fracturing of oil and gas. About 80 people who filled a hotel ballroom here rattled off what they saw as flaws with the draft regulations, including that the proposed rule fails to provide enough advance warning when fracking will occur and would not force public disclosure of all chemicals used. Long Beach, California has employed fracking for the past 17 years. The city's Department of Gas and Oil estimates less than 10 percent of wells involve the process. Long Beach averages five 'fracs' per year, all under the oversight of the state's Department of Oil and Gas. Additionally no contamination has been detected in local groundwater supplies, which produce about 60 percent of Long Beach's drinking water. This oil is being produced in the Wilmington field, near the Long Beach Oil Field. In November 2014, residents of La Habra Heights, a town in Los Angeles County, succeed in qualifying a fracking ban for March 2015 ballot. However, the measure was deafted in early March 2015 during the city election. In December 2015 activists in the Los Angeles area called for a moratorium on fracking in California, arguing that during a drought a water-intensive activity such a fracking is not viable. In November 2015, Youth for Environmental Justice and the South Central Youth Leadership Coalition filed an environmental justice lawsuit against the city of Los Angeles. The lawsuit alleges that Los Angeles has a history of “rubber stamping” drilling applications, allowing oil operations to move through the permitting process without requiring the necessary environmental reviews dictated under California state law. According to the lawsuit, most of the drilling operations have ended up concentrated in and around low-income minority areas of South Los Angeles and Wilmington. It is alleged that the city allows noisy, high emission-polluting diesel run rigs at oil wells in South Los Angeles and Wilmington, while requiring cleaner-running electric rigs in high income whiter areas on the Westside. On March 24, 2015 activists disrupted a workshop held in Long Beach, California by Division of Oil, Gas and Geothermal Resources (DOGGR) on “aquifer exemption”. The activists offered DOGGR officials fracking water and unrolled a banner which read, "Gov. Brown, Stop Letting Big Oil Poison Our Water". The activists were removed from the meeting. In late June 2015, in response to California's Division of Oil, Gas and Geothermal Resources okaying permits for nine fracking operations off the coast of Long Beach, Center for Biological Diversity urged Gov. Jerry Brown these fracks, which would be the first in California waters since 2013. On July 14, 2015 a group of anti-fracking activists in Long Beach gathered outside Long Beach City Hall to protest offshore fracking scheduled to take place in Long Beach Harbor. In July 2015, the California Department of Conservation’s Division of Oil, Gas and Geothermal Resources approved fracking of about a dozen wells operated by THUMS Long Beach, including five new operations. The fracks would be the first since 2013. Activists are concerned that drilling could result in an environmental disaster, such as an oil spill. On October 7, 2015, anti-fracking activists marched through downtown Long Beach to call for an end to fracking offshore in the city's waters. The activists called for a stop to the 13 new frack jobs of Long Beach's oil islands that were approved earlier by the California Department of Conservation’s Division of Oil, Gas and Geothermal Resources. In December 2015 the City of Long Beach cancelled its plans to frack 13 new wells on its offshore platforms. These fracks would have been the first new offshore fracks in the state since 2013. On July 2, 2012, the Culver City Council approved a resolution urging Gov. Jerry Brown and the California Department of Conservation's Division of Oil, Gas & Geothermal Resources to impose a ban on hydraulic fracturing until regulations have been adopted ensuring the protection of public health, safety, and the environment. The council’s unanimous decision came a week before the completion of a PXP fracking study at the Inglewood oil field. In Orange County, California activists are attempting to raise awareness and one day ban the practice of fracking. Activists in the city of Brea are concerned fracking may cause groundwater pollution as well as earthquakes from injection wells. On January 26, 2015, California Resources Corp announced they would no longer seek approval for a large oil drilling project in Carson, California. The company planned to drill 200 wells that was to initially employ the use of fracking. Local environmentalists had successfully lobbied the Carson City Council to pass a 45-day moratorium on new oil drilling in March 2014. California Resources Corp soon dropped their plans to frack, yet environmentalists continued to oppose the operation until it was abandoned. In February 2015 dozens of environmental groups filed a legal petition that asked California Gov. Jerry Brown (D) to ban hydraulic fracturing for oil and natural gas in the state. The petition was preceded by a rally in Oakland that was attended by 8,000 people that supported a ban. SB 4 - passed California’s Senate in 2013 and Assembly on September 11, 2013. Governor Brown signed the bill into law shortly after. SB 4 is the first time that state will regulate acidizing and other forms of unconventional well stimulation for oil and gas. Yet the Natural Resources Defense Council, California League of Conservation Voters, Clean Water Action, and Environmental Working Group, which backed earlier versions of the measure, withdrew their support for the final bill, saying it was too watered down. Last-minute amendments to the bill included requiring state regulators to green-light all fracking requests by oil and gas companies in California until at least July 1, 2015 (when the state is scheduled to complete an environmental review of fracking in California), and allowing the head of DOGGR to rule whether the California Environmental Quality Act applies to oil and gas, mirroring the federal loophole that oil and gas gained from the National Environmental Policy Act. According to Earthworks: "Over the past year, we watched SB 4 weaken – especially if the bill harms our ability to apply CEQA to oil and gas fracking and acidizing in the state." On July 1, 2015 the state of California finalized its regulations for SB 4, despite the fact its own fracking study was not yet completed. The study on fracking's potential impacts was to be published on January 1, 2015, which prompted some in the environmental community to criticize the Gov. Brown for passing a law that had not yet come under official environmental and health review. On July 9, 2015, the California Council on Science and Technology (CCST) released its report on well-stimulation in California, which was pursuant to Senate Bill 4. CCST noted that, "The purpose of the report was to synthesize and assess the available scientific information associated with well stimulation treatments (WST) in California." The study noted that state agencies should ban the practice of reusing fracking wastewater for any purpose that could impact human health or the environment until further testing of its potential impacts could be done. The study also stated that thus far, no California agency had conducted a systematical study of the possible impacts from the reuse of fracking wastewater. The study also noted that there was lax oversight for fracking operatoins in California. AB 591 - introduced by Assemblyman Bob Wieckowski (D-Fremont) in 2011 was originally touted as a way to require oil companies to disclose where they employ the fracking process, what chemicals they use, and how much water they pump. The lawmaker described it as a "deliberately modest step." Among the chief opponents was Halliburton, who argued that full disclosure of the chemicals in its fracking fluid would compromise valuable trade secrets. According to the Los Angeles Times: "although Halliburton never registered as an official opponent, Halliburton and its lobbyists ran a quiet campaign to weaken the legislation, meeting privately with lawmakers and state agencies. During a committee hearing, lobbyist Terry McGann of the California Strategies firm, acknowledged that Halliburton does "want to protect the tens of millions of dollars in investments they've made for their particular hydrofracking fluid combination." The bill later stalled. The amended version of the chemical disclosure bill, AB 591, allows energy firms to withhold certain chemicals from public disclosure by filing a trade secret claim with state regulators. It did not make it to the Senate for a full vote. Additionally, concerns that the new provision to the bill could open the doors to "fracking before regulations are finalized, expected in 2015." Some organizations that oppose the bill claim it could block Gov. Brown from instituting a moratorium on fracking before 2015. AB 972 - the bill would "Bar the supervisor from issuing a permit for an oil and gas well that will be hydraulically fractured until regulations governing its practice are adopted." Passed by the Senate Environmental Quality Committee on July 2, 2012, but did not make it to the Senate for a full vote. In May 2013 a trio of bills aiming to impose a moratorium on fracking in California were given the go-ahead from the state Assembly's Appropriations Committee. It was reported, "Assemblyman Richard Bloom's (D-Santa Monica) bill would put a moratorium on fracking and require legislative action to lift it, while Assemblywoman Holly Mitchell's (D-Los Angeles) bill would only lift the moratorium after an independent commission studies the practice's environmental effects. Assemblyman Adrin Nazarian's (D-Van Nuys) bill only applies to the area surrounding sources of groundwater that could theoretically be contaminated by the release of fracking wastewater." Mitchell's bill, AB 1323, was rejected by a 37-24 vote in late May 2013. It was reported that ban’s proponents blamed "lobbying by the oil industry, which spent nearly $1.5 million in three months fighting the bill." On September 4, 2013 Los Angeles City Council members Paul Koretz and Mike Bonin introduced a motion to place a moratorium on fracking within the city of Los Angeles and along the city’s water supply route. According to EcoWatch, "They were joined outside beforehand by the consumer advocacy group Food & Water Watch, the environmental health group Physicians for Social Responsibly-Los Angeles, Citizens Coalition for a Safe Community (CCSC) and the Sierra Club to announce the motion at a press conference." In early May 2014 Beverly Hills became the first California city to pass a fracking moratorium after a unanimous city council vote. Although Beverly Hills has no active fracking operations, the ban took effect on June 6, 2014. On April 15, the Compton City Council voted on enacting a moratorium on "fracking, acidizing, or any form of well-stimulation". On July 21, the Western States Petroleum Association (“WSPA”) filed a lawsuit in an attempt to overturn Compton's ban on fracking in L.A. County Superior Court. WSPA claims "such fracking bans are preempted by state regulation of well stimulation, Senate Bill 4 (“SB 4”) and the Division of Oil, Gas and Geothermal Resources’ (“DOGGR”) regulations. WSPA alleges several other legal grounds for the ordinance’s invalidity. The industry group claims that the city failed to give adequate notice of the ordinance, violating state and federal Constitutional due process guarantees. Additionally, the lack of public debate when passing the ordinance violated the City’s policy powers. Mineral rights holders were not given a forum for public input." SB1054, as amended (March 29, 2012), would require the drilling operator to file a written notice of intention to commence drilling, and submit to the Legislature an annual written report regarding the implementation of the notice requirement. The bill does not call for a public disclosure of the chemicals being used. On May 30, 2012, the Senate defeated the legislation by a bipartisan vote of 17-18. According to Republican Senator Jean Fuller of Bakersfield: "This bill would have resulted in the delay of gas and oil production in California." In April 2012 a bill regulating water use by oil producers cleared its first legislative test. The bill, authored by Assemblymember Mark Stone, would require companies to "disclose the source and amounts of water used in production, including fracking. It also demands they get approval from state water regulators on how the water would be disposed." It passed the Assembly's Natural Resources Committee on a 6-3, party-line vote. In April 2015, Gov. Jerry Brown announced emergency water restrictions across California in an effort to battle the state's severe drought. However, oil and gas companies were not forced to curtail water use in oil and gas operations, which inculded fracking. Enviornmentalists were not pleased with Gov. Brown's decision. “Governor Brown is forcing ordinary Californians to shoulder the burden of the drought by cutting their personal water use while giving the oil industry a continuing license to break the law and poison our water,” said Zack Malitz of environmental group Credo said to Reuters. As of 2012, California had no rules specific to fracking, although the California Division of Oil, Gas and Geothermal Resources (DOGGR) engineers approve fracking wells on a case by case basis. The Department of Conservation, DOGGR's parent agency, has announced plans to contract an independent scientific study of hydraulic fracturing in California. Depending on the results of that study and input gathered at community workshops, the department may begin drafting fracking regulations in 2013. In March 2012 California Governor Jerry Brown stated that his administration is looking into standards for fracking in the state. Brown stated that “California is the fourth-largest oil-producing state, and we want to continue that.” That month, the lower house's subcommittee on resources tabled the Gov. Brown administration's request for an additional 18 positions in the state's oil and gas agency, saying that 35 positions and $3.2 million had already been approved in the last two years, in part to develop fracking regulations that have yet to be developed. The state's nonpartisan legislative analyst reported that 13 of those slots remain vacant. On May 9, 2012, the Assembly Subcommittee on Resources and Transportation approved Gov. Jerry Brown's request for an additional 18 positions. Lawmakers also set guidelines for fracking rules, adopting budget language that gives regulators until 2014 to finalize regulations. In December 2012, CA Gov. Brown proposed regulations that would require energy companies to disclose their fracking plans to the state 10 days before starting operations. The companies also would be required to post to an online database - FracFocus - with the locations of their work and the chemicals used, and they would face new rules for testing and monitoring their wells. Critics said the rules would require only three days public notice of the fracking site before work begins, do not require notification of adjacent property owners, and do not include an appeals process for property owners who oppose the fracking work. The rules require for the first time that energy companies disclose the chemicals they are using, but the database for that information - FracFocus - is not subject to public records laws. And companies may claim "trade secrets" exemptions to withhold the names of the chemicals they inject. The proposed rules were released in December 2013. In 1983, the EPA granted the California Division of Oil, Gas and Geothermal Resources (DOGGR) “primacy,” or primary authority, for regulating what are known as Class II injection wells -- including wells in which operators inject fluid deep into the earth to enhance oil recovery or to dispose of fluid wastes associated with oil and gas production (disposal wells). Class II injections wells use well injecting fluid associated with the production of oil and gas. Congress in 2005 exempted fracking from the Safe Drinking Water Act, putting the responsibility on states. According to the state Department of Conservation (DOC), DOGGR has regulations in place for enhanced oil recovery (EOR) utilizing steam flood and water flood injection through its Underground Injection Control (UIC) program, and "any alternative methods for EOR – such as hydraulic fracturing -- would require additional regulations and/or statutes." In some locales, environmental groups have made a push that fracking should be considered as “injection,” and the well that is being fractured should be considered as a UIC Class II injection well. Other state regulators in the oil and gas arena have countered that hydraulic fracturing should be considered a “well treatment” not subject to UIC. If hydraulic fracturing were considered as UIC, it would bring in a host of review and testing requirements along with oversight by USEPA: the DOC states that "injection project permits often include conditions, such as approved injection zones, allowable injection pressures, and testing requirements. State regulations were designed to ensure that injected fluids are confined to the project area and zone, and that formation pressures are not exceeded to the extent that damage occurs." According to the California Independent Petroleum Association, fracking is not a Class II well, and fracking is indirectly regulated by the state's regulation of non-disposal drilling wells. On March 28, 2012, the California Division of Oil, Gas and Geothermal Resources sent letters asking California's oil producers, on a voluntary basis, to post records of their fracking activity to FracFocus. In May 2012 the oil industry group Western States Petroleum Association said its members that use fracking to extract oil will voluntarily post information about their operations on the industry website, likely by the end of June 2012. Rules proposed in December 2012 would make that posting mandatory, although the information is not be subject to public records laws, and companies could claim "trade secrets" exemptions to withhold the names of the chemicals they inject. In August 2013 the U.S. Bureau of Land Management reported that it will launch California's first statewide study of fracking and its potential hazards. As of 2012, the oil and natural gas industry spends more than $4 million a year lobbying the California legislature. The Western States Petroleum Association spent the most on lobbying in Sacramento in the first six months of 2013 of any interest group, spending over $2.3 million in the first two quarters, according to quarterly documents released by the California Secretary of State. All but one bill to regulate or ban fracking was defeated in the Legislature in 2013. A March 2013 study by USC and the Communications Institute, a Los Angeles think tank, estimated that development of the Monterey Shale could generate half a million new jobs by 2015 and 2.8 million by 2020, and boost the state’s economy by 14 percent. As reported in DeSmogBlog: "the report acknowledges financial support - though failing to disclose how much funding - from the Western States Petroleum Association (WSPA)" and "one of the co-authors of the 'study' - Fred Aminzadeh - is currently an oil and gas industry employee." Aminzadeh is founder and President of global oil and gas industry consultancy firm FACT-Corp. and on the Advisory Board of both Western Standard Energy Corp. and Saratoga Resources. The Division of Oil and Gas update its fact sheet to acknowledge that fracking is currently taking place in California and has been for decades. The Division should identify and track where fracking is taking place and post the information on a state-run website. California state agencies should develop regulations that require oil and gas companies to disclose what chemicals they are using to frack each well (with volume and concentrations), the amount of water used, the source of the water, and whether any radioactive tracers are being used, to allow regulators, scientists and landowners to learn what substances to test for in nearby water supplies. Landowners within at least two miles of proposed drilling or fracking operations should be notified and given an opportunity to weigh in on permit decisions. Oil and gas companies should be required to pay for testing and monitoring of nearby groundwater before and after drilling and fracking by independent laboratories selected by potentially affected landowner, similar to an EPA recommendation to New York State authorities. Water recycling should be mandatory for oil and gas operations. Drilling and fracking should not be allowed close to residential areas or drinking water sources, to prevent risks. In 2015 the Environmental Working Group (EWG) published "TOXIC STEW What’s in Fracking Wastewater," which responded to the first year of California’s fracking disclosure program created by State Senator Fran Pavely's bill Senate Bill 4 in 2014. Hazardous chemicals as benzene, formaldehyde, toluene, chromium-6, and arsenic, and metals as lead, and radiation were found wastewater. Some detected at average levels that according to the EWG are hundreds or thousands of times higher than the state’s drinking water standards or public health goals. Since December 2013 to the publication of the EWG report in 20105, drillers in California reported using more than 200 different chemicals in hydraulic fracturing fluids. They include neurotoxins and known carcinogens identified on California’s Proposition 65 list. Benzene in wastewater was of particular concern to EWG report. One of the 293 samples tested contained benzene at levels ranging from twice to more than 7,000 times the state drinking water standard. EWG analyzed all available state records of wastewater samples from wells fracked and acidizing well stimulation in 2014. In October 2015 DOGGR, under the Department of Conservation, released a well injection report heavily criticizing their own well injection program. The report charged that the agency oversight of wastewater injection wells failed because of inadequate recordkeeping, lack of regulators, inconsistent enforcement, inaccurate permitting and poor monitoring. For 32 years, state officials permitted drillers to pump leftover wastewater back into the ground, on the assumption that federal officials had granted exemptions from laws that protect groundwater aquifers from contamination. The US Environmental Protection Agency claims no exemptions were granted. The agency charged their own well records were often incomplete or missing. Approximately 47% of the files did not contain enough information about well casings. Seventy-eight percent of the projects did not undergo a required geologic and technical analysis. Only five projects had undergone this analysis from 2010 to 2015. ↑ 1.0 1.1 1.2 1.3 Michael J. Mishak, "Oil extraction method widely used in California with little oversight," LA Times, March 14, 2012. ↑ "California's Controversial Oil Drilling" By Stephen Stock, Liza Meak, and Mark Villarreal NBC Bay Area, April 27, 2012. ↑ John Cox, "Oil companies agree to post fracking data," Bakersfield.com, May 15, 2012. ↑ Amy Harder, "California's Top Oil Regulator on Fracking, Climate Change, and Fossil Fuels," October 16, 2013. ↑ Rory Carroll and Braden Reddall, "Insight: California environmentalists fear frack fight a distraction," Reuters, May 28, 2013. ↑ "Study: California using fracking in up to half of new wells" Jeremy B. White, January 1, 2015, Sacramento Bee. ↑ El Shaari, N., W.A. Miner, "Northern California Gas Sands - Hydraulic Fracture Stimulation Opportunities and Challenges," SPE Western Regional and Pacific Section AAPG Joint Meeting, Bakersfield, CA March 31-April 2, 2008. ↑ "Gov. Jerry Brown says he's studying 'fracking' in California" Michael J. Mishak, Los Angeles Times, March 23, 2012. ↑ 9.0 9.1 9.2 9.3 9.4 9.5 9.6 9.7 9.8 Renée Sharp and Bill Allayaud, "California regulators: See no fracking, speak no fracking," Environmental Working Group, February 2012. ↑ "Californians uneasy about fracking's safety, lack of oversight" Evan Halper, Los Angeles Times, June 7, 2013. ↑ "Most Californians want fracking regulated" Central Valley Business Times, September 25, 2013. ↑ Bill McKibben (8 March 2012). "Why Not Frack?". The New York Review of Books 59 (4). Retrieved on 21 February 2012. ↑ Tony Z., "The Oil Industry's California Takeover," Daily Kos, March 1, 2012. ↑ Michael J. Mishak, "State officials ask energy firms to disclose 'fracking' sites," Los Angeles Times, April 2, 2012. ↑ "Monterey Shale" California Oil & Natural Gas, accessed April 25, 2012. ↑ Dave Roberts, "10 reasons why fracking for dirty oil in California is a stupid idea," Grist, March 18, 2013. ↑ "Monterey Shale - California's Sleeping Giant?" Rhonda Duey, E&P, June 1, 2011. ↑ 19.0 19.1 Dave Roberts, "10 reasons why fracking for dirty oil in California is a stupid idea," Grist, March 18, 2013. ↑ 20.0 20.1 Jason Raznick,"Four ETFs For The Monterey Shale," Forbes, October 21, 2011. ↑ 21.0 21.1 "California’s Brown Says He’ll Consider Fracking Standards" James Nash, Business Week, March 23, 2012. ↑ "Vast Oil Reserve May Now Be Within Reach, and Battle Heats Up" Norimitsu Onishi, New York Times, February 3, 2013. ↑ "U.S. officials cut estimate of recoverable Monterey Shale oil by 96%," LA Times, May 20, 2014. ↑ " Ellen Knickermeyer, Associated Press, October 8, 2015. ↑ J. David Hughes, "Drilling California: A Reality Check on the Monterey Shale," PCI Report, Dec 2, 2013. ↑ "Spike in California Gas Drilling in California" State of California Department of Conservation, September 10, 2011. ↑ Julie Cart, "Fracking in Los Angeles? Oil well oversight in L.A. Basin is 'inconsistent,' audit finds," Los Angeles Times, October 8, 2015. ↑ Ngoc Nguyen, "Fracking in Los Angeles? Test Wells at Urban Oil Field Spark Water Worries," Inside ClimateNews, April 13, 2012. ↑ "Could Fracking in Los Angeles Cause an Earthquake?" Tessa Stuart, LA Weekly, May17, 2012. ↑ Steve Horn, "Frackademia: Controversial SUNY Buffalo Shale Institute's Reputation Unraveling," Desmogblog, Oct. 11, 2012. ↑ "Calif. finds more instances of offshore fracking" Alcia Chang, Jason Dearen, Yahoo! Finance, October 19, 2013. ↑ "What the Frack Is Happening Under Long Beach?" Joshua Frank, OC Weekly, April 22, 2015. ↑ "Environmentalists want California to stop offshore fracking" Associated Press, June 30, 2015. ↑ Heather Kathryn Ross, "One California County's Fracked Isea," December 09, 2015. ↑ John Cox, "Fracking data flows from Kern oil fields," Bakersfield.com, April 16 2012. ↑ Jonathan Thompson, "NASA finds methane hot spot over Four Corners, The culprit is the extensive fossil fuel industry infrastructure, not just fracking or coal mines," High Country News, October 12, 2014. ↑ James Burger and John Cox, "Supervisors approve hard-fought oil and gas plan," The Bakersfield Californian, November 9, 2015 . ↑ Erich Schwartzel and Andrew McGill, "With gas firms entering central California, vineyard owners unsure of fracking effects on land," Pipeline, October 7, 2012. ↑ Erich Schwartzel and Andrew McGill, "Anti-fracking initiative in the works for Monterey County," KSBW.com. , Feb 04, 2016. ↑ "Hooked on Frack? Where Oil Companies Could Be Fracking in Santa Barbara County" Natalie Cherot, Santa Barbara Independent, November 15, 2012. ↑ Zach Swim and Dina Rasor, "Lack of State and Federal Oversight of Offshore Fracking Could Imperil the Santa Barbara Coastline," Truthout, October 3, 2012. ↑ 43.0 43.1 Mike Ludwig, "Special Investigation: Fracking in the Ocean Off the California Coast," Truthout, July 25, 2013. ↑ Mark Denin and Shiva Polefka, "Fracking Goes To Sea: California Regulators Startled To Learn Of Offshore Hydraulic Fracturing," Climate Progress, Oct 24, 2013. ↑ "Dirty Water: Fracking Offshore California," Environmental Defense Center, 2013. ↑ [ http://www.eenews.net/energywire/2013/10/22/stories/1059989146 "For Calif. officials, offshore fracking flew under the radar,"] E&E, October 22, 2013. ↑ 47.0 47.1 "Lawsuit Prompts Offshore Fracking Moratorium Off California Coast" Center for Biological Diversity, Kristen Monsell, January 29, 2016. ↑ "Pipeline Owner in Santa Barbara Oil Spill Has Had 175 Spill Incidents Since 2006" Center for Biological Diversity, May 21, 2015. ↑ "Refugio Reviewed Did We Learn Our Lesson on Pipeline Safety?" By Kelsey Brugger, Santa Barbara Independent, December 24, 2015. ↑ "More Details on Ocean Fracking Revealed as Environmentalists Challenge Federal Regulators" By Lena Garcia, Santa Barbara Independent, September 15, 2015. ↑ "PHMSA Releases Detailed Findings on Oil Spill" By Kelsey Brugger, Santa Barbara Independent, February 19, 2016. ↑ "More Details on Ocean Fracking Revealed as Environmentalists Challenge Federal Regulators" By Gina Potthoff, Noozhawk, February 17, 2016. ↑ Natalie Cherot, "Amid Farmland, an Oil Field," Earth Island Journal, Spring 2015. ↑ Seema Mehta and Louis Sahagun, "L.A. County leaders oppose plan to drill for oil in Whittier hills," LA Times, Oct 29, 2013. ↑ "California Finally to Reap Fracking’s Riches" Alison Sider & Cassandra Sweet, Wall Street Journal, October 7, 2014. ↑ "SLO Refinery Wants Oil by Train Phillips 66 Runs into Public Resistance over Proposal to Lay New Tracks and Unload More Canadian Crude" Natalie Cherot, The Santa Barbara Independent, January 23, 2015. ↑ "Oil, Gas and Fracking in California" Clean Water Action, accessed August 1, 2014. ↑ "Analysis of California’s Fracking Wastewater Reveals a Slew of Toxic Chemicals Linked to Cancer and Other Illnesses" EcoWatch, March 10, 2015. ↑ Jeremy Miller, "The Colonization of Kern County: A story of oil and water," Orion magazine, January/February 2011 issue. ↑ "Confirmed: California Aquifers Contaminated With Billions Of Gallons of Fracking Wastewater" Mike G, DeSmogBlog, October 7, 2014. ↑ "High levels of benzene found in fracking waste water" Julie Cart, Los Angeles Times, February 11, 2015. ↑ Tasha Stoiber and Bill Walker, ""TOXIC STEW What’s in Fracking Wastewater," EWG.org, March 10, 2015. ↑ "Hundreds of illicit oil wastewater pits found in Kern County" Julie Cart, Los Angeles Times, February 26, 2015. ↑ "Fracking-affected Food Should be Labeled, Lawmaker Says" Dennis Romero, LA Weekly, August 17, 2015. ↑ "Oil, Gas & Geothermal - Injection Wells," CA DOC Website, accessed May 2012. ↑ "California Halts Injection of Fracking Waste, Warning it May Be Contaminating Aquifers" Mother Jones, July 22, 2014. ↑ "CALIF. DIVISION OF OIL, GAS, AND GEOTHERMAL RESOURCES SEEKS END TO INJECTION IN 12 KERN COUNTY WELLS" Dept. of Conservation, March 3, 2015. 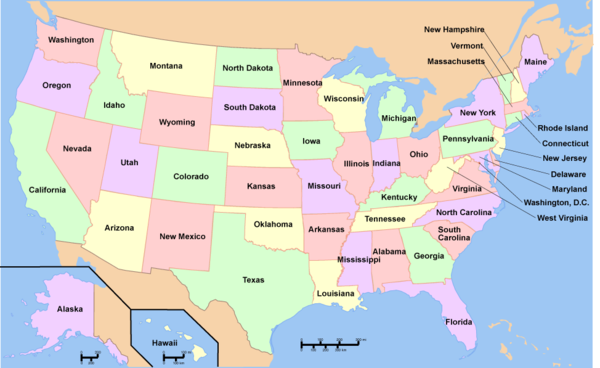 ↑ "State shuts 33 wells injecting oil wastewater into aquifers" David R. Baker, October 16, 2015. ↑ Scott Thrill, "California’s unregulated fracking problem," AlterNet, April 9, 2012. ↑ USGS, "Are Seismicity Rate Changes in the Midcontinent Natural or Manmade?" USGS 2012 Report. ↑ T. H. W. Goebel, S. M. Hosseini, F. Cappa, E. Hauksson, J. P. Ampuero, F. Aminzadeh, J. B. Saleeby, "Wastewater disposal and earthquake swarm activity at the southern end of the Central Valley, California," Geophysics Research Letters, February 2016. ↑ 85.0 85.1 Robert Collier, "A New California Oil Boom? Drilling the Monterey Shale - Part 1: Distracted by Fracking?" The Next Generation, August 2013. ↑ 86.0 86.1 RL Miller, "Why Oil Companies Want to Drop Acid in California," Take Part, Sep 2, 2013. ↑ John Cox, "Fracking data flows from Kern oil fields," The Bakersfield Californian, April 16, 2012. ↑ 89.0 89.1 John Cox, "Oil industry frets over sinkhole controversy," The Bakersfield Californian, Oct 3, 2011. ↑ "Environmental groups sue California regulator over fracking," Reuters, Oct 16, 2012. ↑ "Brown Administration Sued for Ignoring Risk Report on Fracking" Center for Biological Diversity, July 30, 2015. ↑ Michael J. Mishak, "Oil extraction method widely used in California with little oversight," LA Times, March 14, 2012. ↑ "Environmental groups sue to prevent fracking in Calif." Tia Ghose, California Watch, December 19, 2011. ↑ "First California Fracking Challenge Is Defeat for U.S." Karen Gullo, Bloomberg, April 8, 2013. ↑ Cooley, M., news/local/govt-and-politics/county-levelfracking-rules-get-board-ok/article_c4a7c704-20a6-11e1-9902-0019bb2963f4.html "County-level ‘fracking’ rules get board OK," Santa Maria Times, December 7, 2010. ↑ 96.0 96.1 "Not Just a Fracking Ban" Jillian Kay Melchior, National Review Online, October 23, 2014. ↑ "Fracking bans pass in 2 counties, fail in Santa Barbara" Molly Peterson, KPCC, November 5, 2014. ↑ "Feds Sued Over Santa Barbara Fracking Permits" ABC News, Decemember 3, 2014. ↑ "To fight fracking bans, oil firms heavily outspend environmentalists" David R. Baker, SF Gate, November 2, 2014. ↑ "Oil, gas industries fight local anti-fracking measures" Timonthy Cama, November 13, 2014. ↑ "CAMPAIGN 2014: Measure J moves forward in San Benito County" Kion, November 5, 2014. ↑ "Fracking: Oil company sues to overturn San Benito County fracking ban; could affect other counties" San Jose Mercury News, Paul Rogers, March 3, 2015. ↑ "Mendocino County is first California community to enact ban" Bob Downing, Akron Beacon Journal, November 5, 2014. ↑ "Citizens, Groups Calling for a Ban on Fracking in California," Food & Water Watch, May 15, 2012. ↑ "Culver City Moms (and Dads) Unite Against Fracking" Crystal C. Alexander, Culver City Patch, June 11, 2012. ↑ "Calif. walloped with criticisms on proposed fracking rules" Energy Wire, Feburary 20, 2013. ↑ "Cal Assembly bill seeks to force disclosure of chemicals used in drilling wells" Kristopher Hanson, Press-Telegram, June 28, 2011. ↑ "La Habra Heights anti-oil initiative qualifies for 2015 ballot" Mike Sprague, Whittier Daily News, November 3, 2014. ↑ "Election 2015: La Habra Heights anti-oil initiative loses" Whittier Daily News, Mike Spraugue, March 3, 2015. ↑ "‘Fracking’ Opponents Renew Calls For Moratorium Amid Drought" CBS Los Angeles, August 13, 2015. ↑ "Los Angeles sued over oil well hazards faced by minorities," Alex Dobuzinskis, Reuters, Nov 6, 2015. ↑ "Fractivists Bust Up Aquifer Exemption Workshop" Lauren Steiner, CounterPunch, March 30, 2015. ↑ "Just Weeks After Oil Spill, California Officials OK Nine New Offshore Fracks" Center for Biological Diversity, June 30, 2015. ↑ "Environmental Activists Protest Scheduled Fracking in Long Beach" Stephanie Rivera, Long Beach Post, July 15, 2015. ↑ "Environmental Activists Call for End to Fracking Plans at Long Beach Harbor" Stephanie Rivera, Long Beach Post, October 7, 2015. ↑ "Culver City Council calls on state to ban fracking temporarily," LA Times, July 3, 2012. ↑ "When it comes to fracking, fracktivist residents see red, not black gold" Aaron Orlowski, Orange County Register, October 13, 2014. ↑ "Greens petition California to ban fracking" Timothy Cama, The Hill, February 26, 2015. ↑ "Capitol Alert: Fracking bill passes California Assembly" Jeremy B. White, The Tribune, September 11, 2013. ↑ "State Releases New Fracking Regulations Amid SB 4 Criticism, Controversy" Jayni Hein, Legal Plane, November 18, 2013. ↑ 123.0 123.1 Jennifer Krill, "California Comes out of the Fracking Closet," Earthworks, Sep 12, 2013. ↑ Robert Gammon, "Lawmakers Should Reject Fracking Bill SB4," East Bay Express, Sep 11, 2013. ↑ "California OKs Fracking Regulations Before Scientists Finish Studying Risks" Center for Biological Diversity, July 1, 2015. ↑ "SB4" CCST Well Stimulation Project, July 9, 2015. ↑ "California Has No Idea What’s In Its Fracking Chemicals, Study Finds" Samantha Page, Climate Progress, July 11, 2015. ↑ "California Lawmakers Say Fracking Study Shows Lax Oversight" Amy Quinton, Central Public Radio, August 25, 2015. ↑ Michael J. Mishak, "California fracking bill would protect industry ‘trade secrets,’" Los Angeles Times, April 18, 2012. ↑ Ellen M. Gilmer, "Fracking bills derailed in committee," E&E reporter, August 17, 2012. ↑ "Fracking Industry Eyes An Already Water-Starved California" Trisha Marczak, Mint Press News, September 11, 2013. ↑ "California Fracking Ban: Golden State Moratorium On Controversial Practice Moves Forward" Aaron Sankin, Huffington Post, May 17, 2013. ↑ John Upton, "California, Illinois lawmakers welcome frackers," Grist, June 3, 2013. ↑ "Fracking moratorium fails in California despite strong public support" RT.com, May 30, 2014. ↑ "L.A. City Councilmembers Call for Fracking Moratorium " EcoWatch, September 5, 2013. ↑ "Beverly Hills becomes first in California to ban fracking" Reuters, May 7, 2014. ↑ "Industry Group Sues Compton for Moratorium on Hydraulic Fracturing" California Environmental Blog, July 25, 2014. ↑ Loretta Red, "Fracking," SB View, April 10, 2012. ↑ Jim Magill, "California Senate votes down fracking notification bill," Platts, May 31, 2012. ↑ "California bill would target fracking industry's water use" Jason Hoppin, Mercury News, April 16, 2013. ↑ "California Urban Water Use Restricted While Regulators Give Oil Industry Two More Years To Operate Injection Wells In Protected Groundwater Aquifers" Mike Gaworecki, DeSmogBlog, April 8, 2015. ↑ "California water restrictions should cover oil companies, activists say" Russia Today, April 3, 2015. ↑ Michael J. Mishak, "California lawmakers push for fracking rules," LA Times, May 9, 2012. ↑ Paul Rogers, "California releases first-ever fracking regulations," Mercury News, Dec. 18, 2012. ↑ Michael J. Mishak, "Lawmakers want tougher rules for fracking," The Los Angeles Times, February 13, 2013. ↑ Division of Oil, Gas and Geothermal Resources, Department of Conservation, "UIC Application Guidance," accessed April 2012. ↑ Albright, D., Groundwater Protection Office, US Environmental Protection Agency, "Letter to Elena Miller, State Oil and Gas Supervisor," Division of Oil, Gas & Geothermal Resources, July 18, 2011. ↑ "Fact sheet: Hydraulic Fracturing," CA DOC, accessed May 2012. ↑ "Hydraulic Fracturing," CA DOC, accessed May 2012. ↑ "Response to EWG on Hydraulic Fracturing," California Independent Petroleum Association 2012 report. ↑ "Oil industry says it will report California 'fracking' information" David Siders, The Sacramento Bee, May 16, 2012. ↑ David Baker, "U.S. to start first California study of fracking," SF Chronicle, Aug 3, 2013. ↑ Michael Hiltzik, "Let's close the information gap about fracking," LA Times, June 10, 2012. ↑ Dan Bacher, "The Ocean Frackers," Counterpunch, August 7, 2013. ↑ Steve Horn, ""Frackademia" Strikes Again at USC with "Powering California" Study Release," DeSmog Blog, March 14, 2013. ↑ "Oil and gas regulators admit to massive oversight failures in new report" By Molly Petterson, October 8, 2015. Map of fracked oil and gas wells and water supply wells, California State Water Resources Control Board. Dave Roberts, 10 reasons why fracking for dirty oil in California is a stupid idea, Grist, March 18, 2013. This page was last edited on 22 February 2016, at 02:27.